These are great fsm, thanks for posting them all in this one place; it is making it easy for me to follow and "get the hang of". I saw some beautiful rock formations while away. There was no evidence of any deliberate marking on them, but they were so striking it's hard to think they would not have been significant to the original people. When I uploaded the pictures a person who had worked in this field said this, which I thought might interest other photographers, even though it is not about engravings. The formations were granite and known as "Murphy's Haystacks" today. "I know from personal experience of some of the areas where I worked that had outstanding rock formations similar to these that the Traditional indigenous people did consider them of special significance. They marked them with stencil paintings and engravings, but where I worked it was sandstone country and the stencil art soaked into the sandstone and stood out. In granite country the best way to check for old un-noticeable indigenous art was to take photos using polarising filter and camera flash then have a look at the results. The camera with flash and polariser can show things you can not see with your eye." Perhaps it will prove a useful hint for you guys too one day. I'll try posting a link to one of the pics. Last edited by justjj on Sun Oct 27, 2013 5:13 pm, edited 1 time in total. Helix wrote: Good on you, fsm! The other day we discovered this very large and unusual engraving. This enormous figure that has an elaborate headdress sporting four long stalks topped with round shapes. The figure is also holding some unusual item in its left hand. The right arm shows an armband. This engraving is 6 meters tall and 4 meters wide. The engraving shows a shield across the waist of the figure but we suspect there are also legs on this figure that we have not yet discovered. This would make the entire engraving about 11 - 12 meters tall. This is close-up of the headdress. Yesterday we went back to the site that has the large figure with the fancy head dress. This group of engravings is at the other end of this engraving site. There is a figure along side two large eels. This figure is life size and the eels are 3 metres from head to tail. Down in the bottom left corner is a small lizard with its tongue poking out and just above is a small wallaby. On the back of the lower eel could be a club or spear. This is a false colour image designed to bring out the details of the engravings. This is a composite of 677 separate images. Crikey, that's a lot of work, fsm! Helix wrote: Crikey, that's a lot of work, fsm! Yes. My sentiment as well. Your efforts are paying off fsm. The images are getting better each time. I wonder if it isn't a snake on the back of the eel? This is a very large engraving of a whale. The beast is about 12 metres from nose to tail. This is a composite of 1542 separate images. Awesome! The deep body and position of the dorsal fin makes it look like an out-sized killer whale. When you are standing on the rock platform this engraving looks more "correct". The body distortion becomes apparent when the engraving is viewed from above but there is no position at this site where you can see this beast from a high vantage point. fsm wrote: When you are standing on the rock platform this engraving looks more "correct". The body distortion becomes apparent when the engraving is viewed from above but there is no position at this site where you can see this beast from a high vantage point. Makes one ponder upon the visionary capacity of the artist. That makes it even more awesome. It's an anamorphic petroglyph. Notes word of the day.. anamorphic. The ones that have me fascinated are the circles. We are finding them at so many sites. Some sites only have circles without any beasties, people or fish. Some have lots, some have just one. Some are perfect circles, some are dots within a circle, there have been a couple of lovely little spirals, and a couple of bigger spirals. There are ovals, and more free form circular shapes. Most are on horizontal surfaces, but there are also ones on the sides of rocks. roughbarked wrote: Notes word of the day.. anamorphic. Yes, that word is going to be used on the engraving website! flying spaghetti monster wrote: The ones that have me fascinated are the circles. We are finding them at so many sites. Some sites only have circles without any beasties, people or fish. Some have lots, some have just one. Some are perfect circles, some are dots within a circle, there have been a couple of lovely little spirals, and a couple of bigger spirals. There are ovals, and more free form circular shapes. Most are on horizontal surfaces, but there are also ones on the sides of rocks. Great work fsm! It has been really interesting following your posts. This is a false colour composite image of a life-size figure that Ruby found yesterday. This is a most interesting thread. Thanks for all your efforts. This afternoon we went to visit an engraving platform near Oxford Falls and Ruby spotted this very unusual engraving that appears to show a chain of large cowrie shells. Cowrie shells....nice idea. Looks more likely than my convict chain suggestion. This was a nice site, with bonus Croweas and tea trees flowering beautifully, for anyone who wants a pleasant bushwalk. The idea of convict chains is too horrible -- that they were significant enough to be carved into a rock. I'm happy to go with cowrie shells! Helix wrote: The idea of convict chains is too horrible -- that they were significant enough to be carved into a rock. I'm happy to go with cowrie shells! Though I did read too much of Frank Herbert. or did I actually mean Xavier..
anyway, I can leave that up to you. And that's why you should never drunk post, people. My thoughts turned to convict chains because there are large letters in old fashioned style and a broad arrow carved nearby. Mind you, there is a veritable seafood buffet carved into the rocks nearby too. Fsm's picture turned up lines in the middle of the circles which do look conch like, now that he says it. That's part of the fun of the carvings, trying to imagine what some of the more enigmatic shapes could be. And imagining what lives the artists may have led. They're fascinating, whatever the stories behind them. It's great having these pics to look at, esp. given the amount of work that goes into suturing together the really big ones. The pictures often give bonus detail that can get missed thanks to the state of the engravings....hence the conch shell interpretation, because the middle lines within the circles was indistinct. More importantly, they are also a good record. In future we'd like to include something that gives scale to the picture. I keep forgetting to put a ruler in my backpack. It's such a shame that they are being lost.....such a shame that so much has been lost. That ring of shells was very difficult to see. I didn't believe that an engraving was really there, but Ruby kept insisting there was and so I setup the remote flash and the carving appeared. That shot is a composite of 12 images. This engraving is a wobbegong, just a couple of meters from the shells. This is a composite of seven images also taken with the remote flash. We wandered up to Moon Rock engraving site the other day. There are many moons and figures engraved there. This image shows three large eels beside a 3 meter fizz gig. This afternoon we walked a track called 'Road to No-where Track'. This is a very narrow single track that passes by a high point that you have to climb up a near vertical cliff face to access. On top of the high point is a series of very large rock platforms with a nice view over Narrabeen. There is a solitary 4 metre whale engraving that is in pristine condition - probably due to the difficulty of getting here in the first place. The mountain bikers and motorbikes cannot get up to this platform. Yesterday afternoon we revisited the Wheeler Heights site (where the cowrie shell necklace is) and did some more exploring. This image shows two large male kangaroos that have both been speared in the chest area. On the upper right of the image you might be able to make out two small oval shapes. These are called mundoes (footprints). This image is a composite of 365 separate photographs and covers an area of about 5mt by 3mt. fsm wrote: ...This image is a composite of 365 separate photographs and covers an area of about 5mt by 3mt. I have trouble "seeing" the subject of many rock art photos, but that is clear as anyone could wish (or get, I suspect). This is an engraving of a large figure that I found on Sunday afternoon. It was about a 1 km walk through thick scrub and a prickly branch in the eye to get to. The dark band across the middle is the shadow of a nearby tree. That engraving is 'life size', so about 2 mt tall. This is an engraving of a little bird. The two big vertical lines are natural. fsm wrote: This is an engraving of a little bird. The two big vertical lines are natural. This is very interesting work. Enjoying watching. This is an engraving of an eel about 1.2 mt long. It is located along a remote narrow track deep in the bush. We fought our way through some very thick and prickly bush the other day and found this 4 metre tall kangaroo engraving. That is a great kangaroo if a little deforned. Do you know how old it is? It is, isn't it nut. I often can't make the figures out, but that one I could . Ive never seen anything of the kind. 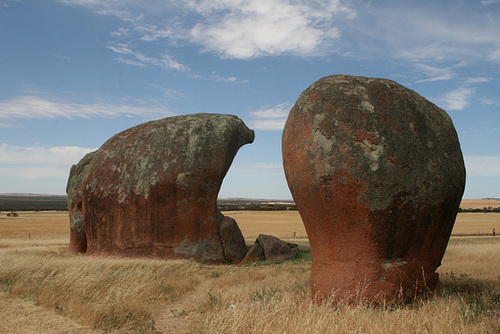 Despite that, someone on flickr years ago told me I should return to Ucontitchie Hill and Murphy's Haystacks (on Eyre Peninsula, SA) with some kind of special filter for the camera ... he reckons there's a very strong chance of invisible (to us) rock paintings. I'm at a place with broadband this w/e so when kids are asleep will try to find and copy what he wrote and pop it in here ... you photographers will likely be able to make sense (and good use) of it. nut wrote: That is a great kangaroo if a little deforned. Do you know how old it is? It is very difficult to date these rock engravings because the Aborigines would re-groove them periodically. It could be between a couple of hundred to a few thousand years old. This engraving appears more proportionally correct to an observer standing nearby. This image is a composite of many smaller images taken by panning the camera across the rock surface, much like scanning a document, and this shows up the distortions of the design. Here we are ... "I know from personal experience of some of the areas where I worked that had outstanding rock formations similar to these that theTraditional indigenous people did consider them of special significance. They marked them with stensil paintings and engravings, but where I worked it was sandstone country and the stensil art soaked into the sandstone and stood out. In granite country the best way to check for old un-noticeable indigenous art was to take photos using polarising filter and camera flash then have a look at the results. The camera with flash and polariser can show things you can not see with your eye." This is a large fish engraving that we found the other day at a well hidden engraving site. This is a composite image made from 18 shots taken with a remote flash. fsm wrote: This is a large fish engraving that we found the other day at a well hidden engraving site. This is a composite image made from 18 shots taken with a remote flash. Could almost be a whale.